Cream cheese flan is the ultimate dessert! Velvety smooth and creamy with a luscious caramel sauce, it’s your favorite cheesecake and flan rolled into one sweet treat! 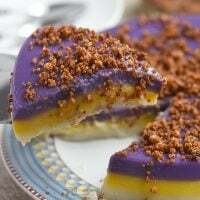 Of the 400-plus recipes we have on Kawaling Pinoy, leche flan is for sure the most precious to me. Not only is it one of the primary drivers of traffic to the site, but it’s also near and dear to me on a personal level. I am not going into detail today on why this said flan is meaningful to me as that story no longer matters. I am a now happier woman; I love and am loved by a better man. Instead, I will share with you another version of creamy custard using cream cheese. If you love cheesecake AND flan, this cream cheese flan is for you. Rich and smooth with a luscious caramel sauce, it’s your two favorite desserts rolled into one scrumptious sweet treat! Like the classic version, this flan de queso is made of milk, eggs, and caramelized sugar that’s blended together and baked or steamed until set. Along with the eggs and the milk, cream cheese is whipped into the custard mixture, giving the flan a dense and sort of a cheesecake-like consistency. I like to prepare mine using an electric mixer but you can cut down the steps by simply processing the eggs, milk and cream cheese in a blender or food processor until there are no lumps. Don’t worry about possible “bubbles”! This cream cheese variation is a bit more forgiving and turns out smooth even when the mixture is roughly blended together. In fact, there’s no need to strain the custard! If it looks too foamy, let it sit for a few minutes before pouring into molds for the foam to subside a little. I caramelized the sugar directly in the metal mold over a stovetop. If prefer an easier method, you can check out my tips on how to caramelize sugar in the microwave. The recipe yields four 1-cup llaneras but you can easily double or triple the batch for a party. Enjoy! Cream cheese flan is the ultimate dessert! Velvety smooth and creamy with a luscious caramel sauce, it's your favorite cheesecake and flan rolled into one sweet treat! In each of 4 llaneras, place 2 tablespoons sugar. Set each llanera over low heat until sugar is melted and golden, Use tongs to move the llanera repeatedly over the flames to prevent sugar from burning and to distribute melting liquid on the bottom of the mold . Remove from heat and allow caramel to cool and harden. In a large bowl, beat cream cheese with an electric mixer at low speed. until smooth and fluffy. Add condensed milk and evaporated milk and stir until well-combined. Let mixture sit for a few minutes to allow some of the foam to subside. Alternatively, combine eggs, evaporated milk, condensed milk, and cream cheese in a blender and process until smooth. Pour mixture into prepared llaneras. Cover llaneras with foil and arrange in a wide, oven-safe dish with about 1-inch of water (water bath). Bake in a 375 F oven for about 50 minutes to 1 hour or until a toothpick inserted in the middle of custard comes out clean. Remove from oven, allow to cool and then refrigerate to set. To serve, turn flan over on a serving plate, ending with caramel on top. The flan will even taste better if you add some grated lemon rind or vanilla . 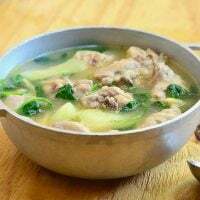 I try to cook leche plan this week , for my family .. 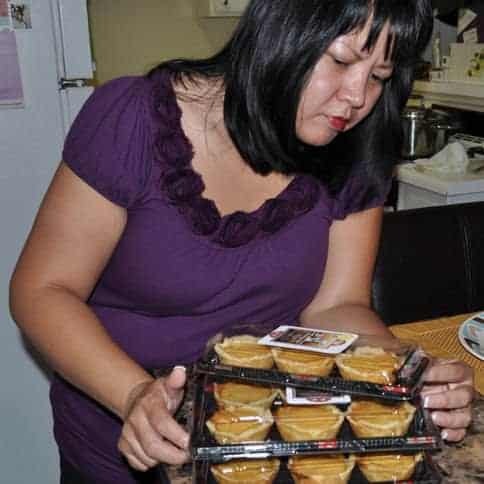 I dont have oven, can i cooke it in the steamer????? Hello, thanks for this recipe.. I am planning to make it for New Year, but I’m wondering if it’s possible to steam it like “leche flan” instead of water bath.. Thanks for the help.. Thanks for this receipe.Ijustmade it today and I did it so perfectly.My kids were delighted and ask me to make it often.I hope I can have ur cookbookin the future. Hello clarify ko lang kung anong klaseng cream cheese ang pwwdeng gamitin? Is it the one in a bottle? The cream cheese used in the recipe is a block and packaged in a small carton. So using the electric mixer won’t add too much air into the eggs? Also should the cream cheese be at room temperature for easier beating? Hi, how long will it last in the fridge? Is it possible to use the round deeper ramekins for this recipe? can i change the cream cheese to eden cheese? Thank you! For an hour? I haven’t tried steaming bit I would guess it would be faster than doing it in the oven. Give it about 40 to 50 minutes depending on the size and depth of the llanera and then check with a toothpick inserted in the center. If it comes out clean, the flan will be ready to cool. Can i change the cream cheese to a ordinary cheese? hi, can i substitute cream cheese into eden cheese? I’ve never personally tried it but I don’t think Eden cheese would be a good substitute to cream cheese in this recipe. Made this and loved it! Way better than an ordinary flan. But would like to know what the shelf life is. Already know the answer when left at room temperature because of previous comment but how about inside the refrigerator? I don’t usually keep leftover food for more than 3 days or 72 hours even in the fridge for food safety but because the flan is pretty sweet, I think a day or two more won’t hurt. Keep in the flan mold so they stay fresh longer. If you’ve inverted the flan already and have leftover, wrap tightly with film to keep freshness. About 3 to 5 days, just keep in the llanera until ready to serve. So there’s no need to use cheesecloth when pouring into the molds? Make sure to strain the mixture using a cheesecloth before pouring into the molds. I do make a leche flan cake, leche flan over chocolate cake and will post it soon 🙂 Yes, girls rule! panu po pg walang blender? anu po pwedeng alternative? tnx..
Pwedeng i-mix sa with electric mixer. Hindi ko pa kasi nasubukan using fork lang or whisk dahil mahirap i-combine because of the cream cheese. Hi. 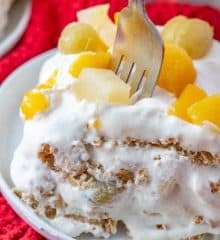 Can I use the cream cheese spread as a substitute for the cream cheese block? Yes, you can. Merry Christmas! Hi Ms. Lalaine. Can I mix the ingredients and let it sit in the fridge over night? And bake or steam it the ff. morning? Where did you buy your oval llaneras? I sent you a message on Instagram and sent the cheese flan picture that I made using your recipe 🙂 you have so many great recipes and thank you for sharing them. Pwede siyang batihan with a hand whisk kung walang mixer. Make sure lang na talagang well blended yung mixture. Medyo matagal lang siguro because of the cream cheese. I’m baking it right now, I just poured the mixture in the mold, do you have to scoop out foam on top? Let it stand for a few minutes so the foam will subside. Isn’t this too sweet?1 can of condensed milk?what if I reduced the amount? I’ve tried it… not sweet. Thanks, Agnes, for the feedback. The flan won’t be sweet, the amount of condensed milk is balanced out by the amount of evaporated milk, eggs and cream cheese. If you’re worried about the sweetness, I’d cut down on the amount of caramel than the condensed milk as this can have an effect on the texture of the flan. hi. how many minutes if steam it? I plan to make this on Saturday, I find it really practical and looks really good. 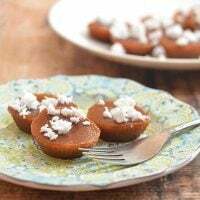 I wonder if I can make the caramel in a llanera and transfer it to a silicone molder so I can have my leche flan there since I really wanted to use my heart shape silicone molder for Valentine’s Day. Please send me your thoughts. 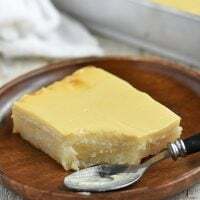 Yes, this flan is easier and more practical to make than regular leche flan as there are no egg whites to waste. I think silicone mold pan will work. Happy valentine’s day! I tried this last night. used the bamboo steamer. too around 40 mins to cook. thanks for this easy, yummy recipe! Q: What’s a good substitute for llanera? Tried this last night and I had to bake it at 2 hours because I used my 7″ cake pan..haha. It was my first time to cook leche flan because I find it time consuming to separate egg yolks from egg whites. Since this recipe calls for whole eggs and my favorite cream cheese I never hesitated to try this one and it came really really really good. My husband and co-workers loved it. Will definitely make this one again. Good day, Ms. Lalaine! Can I just steam this cream cheese flan instead of baking? If ever, paano po ang process and how many hours po? Thank you thank you! Do you separate the egg yolk from the whites? Thanks! it looks so yummy…..hope there there is an alternative flan for diabetics…..
Looks yummy but i am allergic to poultry products. haaay, i’m sad.